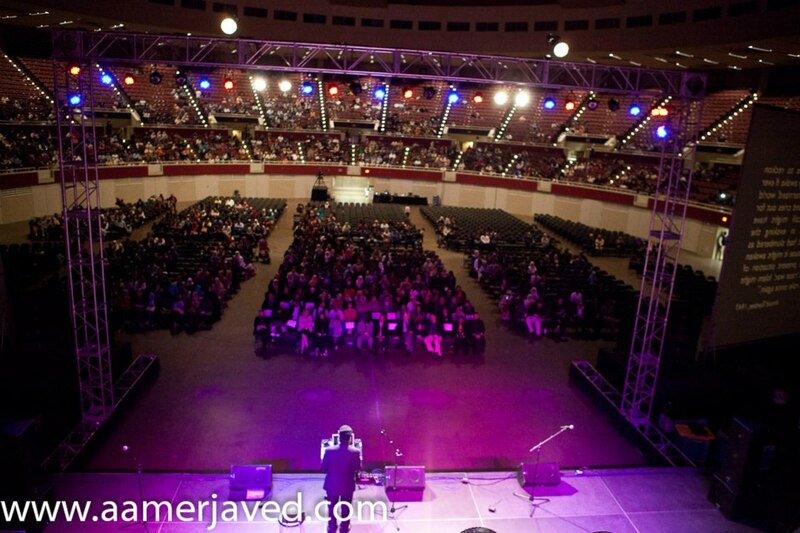 MV: This past Sunday I got to attend, probably one of the biggest landmark events in the Dallas area, “Waves of Unity!” The organization that helped sponsor the event was DINA (Deen Institute of North America) who seek out “to create movement and activity within the community, and to open channels of communication and understanding between people of different faiths and different backgrounds.” The event aimed to, “send waves of unity through the DFW community and to expand these waves so that they carry over to other communities.” This was sought out to be accomplished by inviting thousands of people of different faiths and a variety of different speakers, ALL under one roof! Highlights: The event’s line up of speakers was very impressive with Muslim speakers/performers including, Shayooks Humza Yusuf, Zaid Shakir, Abdul Nassir Jangda, Omar Suleiman, Br. Nouman Ali Khan, Imam Yaseen, Imam Zia Sheikh, Muslim NFL Players (Humza and Hussein Abdullah), Sr. Nicole Queen, Nasheed artists Native Deen, and comedian Aman Ali as the Microphone Coordinator. Although the purpose of the event was to create interaction between people of different faiths, the list of speakers alone was a reason to attend the program! Although I did not get to attend all of the lectures (will discuss that shortly), some memorable moments included the introduction/opening ceremony performed very profoundly, with a variation of different faiths. For example, the opening for the event was performed by Imam Yusuf Kavakci with the Arabic recitation of Surah fatiha along with it’s translation; followed by brief talks by pastors Deborah Lindsey and Bob Roberts, and Rabbi Hanan Schlesinger promoting equality between faiths. Also noteworthy was the small speech about Veterans day by Br. Yunus Anthony (former Aviation Technician for the United States Navy and the Texas Army National Guard). This variation of speakers from different faiths not only set a good standard for the beginning of the show, but also help set out the clear mission the event was based out of. 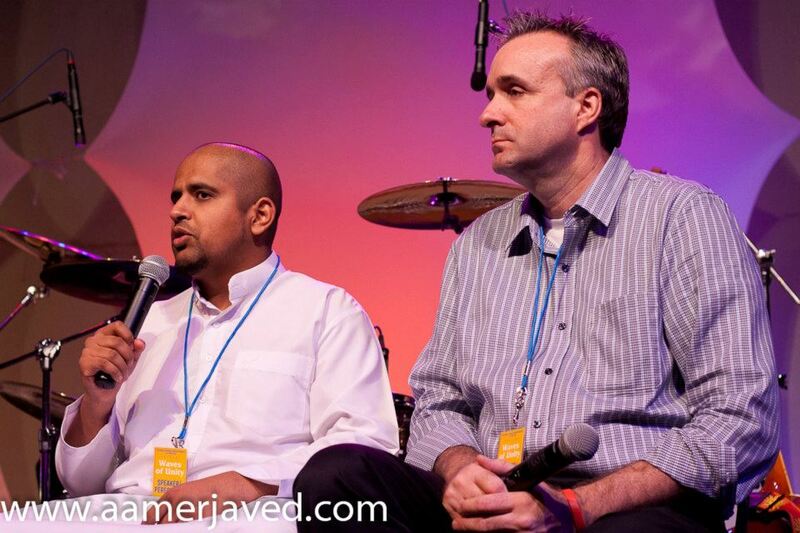 The short discussion between Imam Yaseen and Pastor Wes Magruder, over Wes Magruder’s fasting during Ramadan. 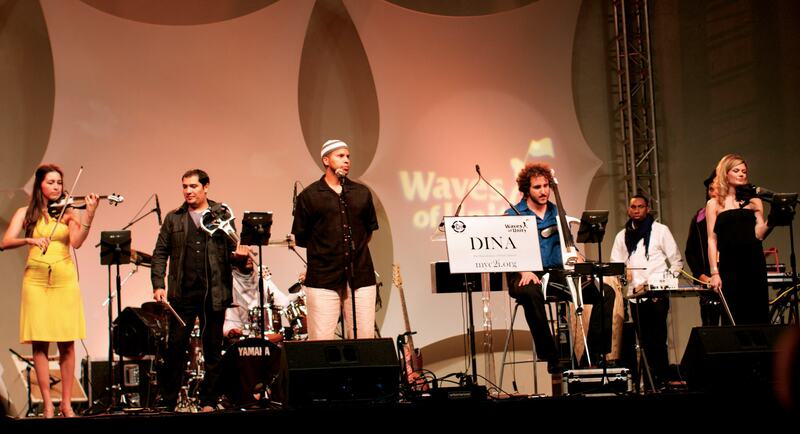 Duet performed together by Native Deen and the musical band, Dallas String Instruments. The amazing breakout sessions with a variety of different speakers. 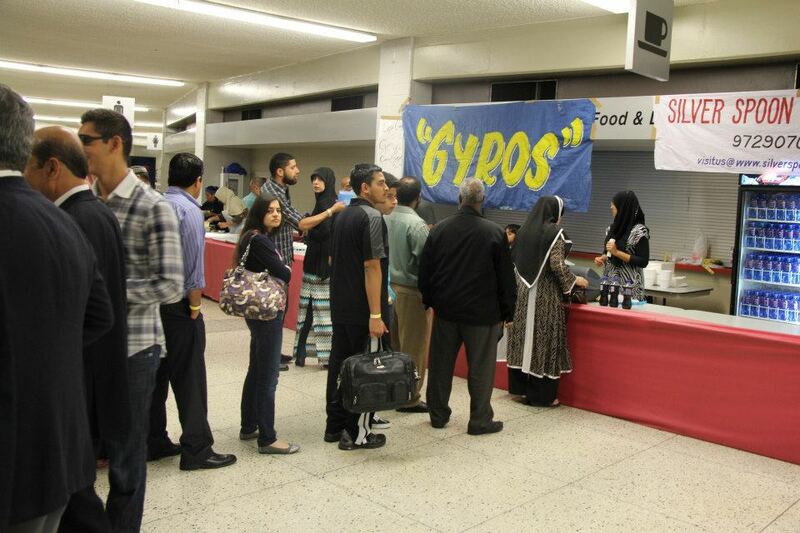 The Food (Silver Spoon) – Gyros and halal meat sandwiches. 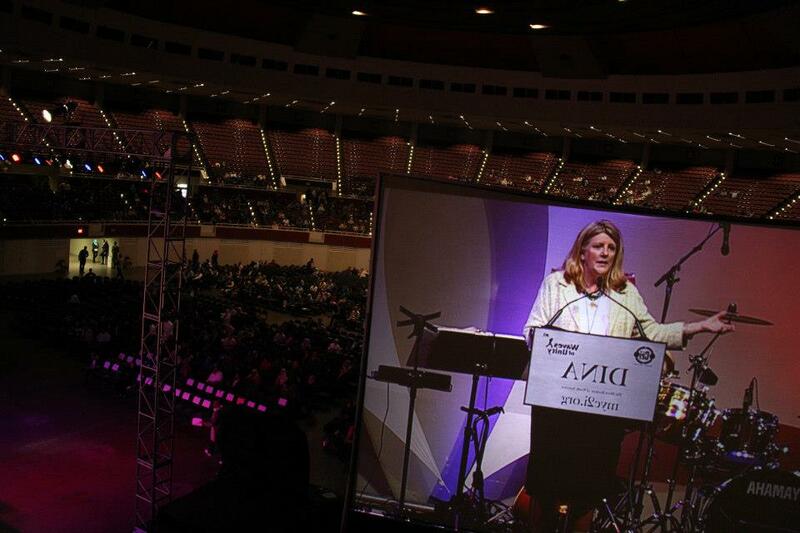 Other speeches during the main session. And last but not least, the amazing conclusion speech by Shaykh Humza Yusuf with his talk about, “the history of Muslims in America,” and the big finale with all the speakers gathered on one stage. MreView: So with all of these big and memorable highlights, was the event worth it? Besides a few exceptions and negatives, the event was all out remarkable and a must attend event, definitely worth it. With keeping in mind that this was the first (of hopefully more in the future insh’Allah) “Waves of Unity” event in the DFW area, but also the fact the core team that organized the event was composed of students younger then 30, the event was of good standings mash’Allah! 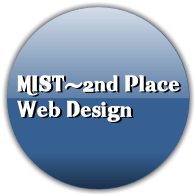 The price of the event was relatively affordable, starting with $25 for the seats furthest back and had a lot to offer in one day, spanning from 2pm to 9:30pm. 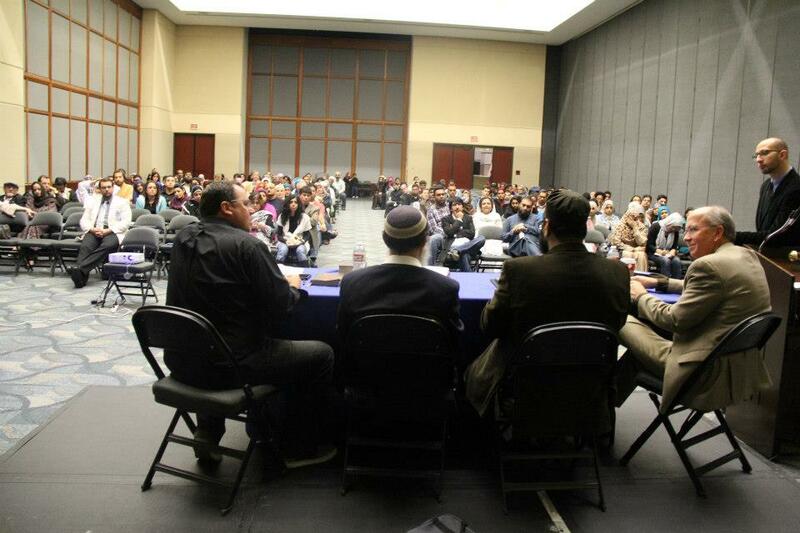 Not only was there a main session featuring a variety of speakers, there were also smaller breakout sessions in smaller rooms, but with more interactive and hot topics such as, misconceptions about Islam. 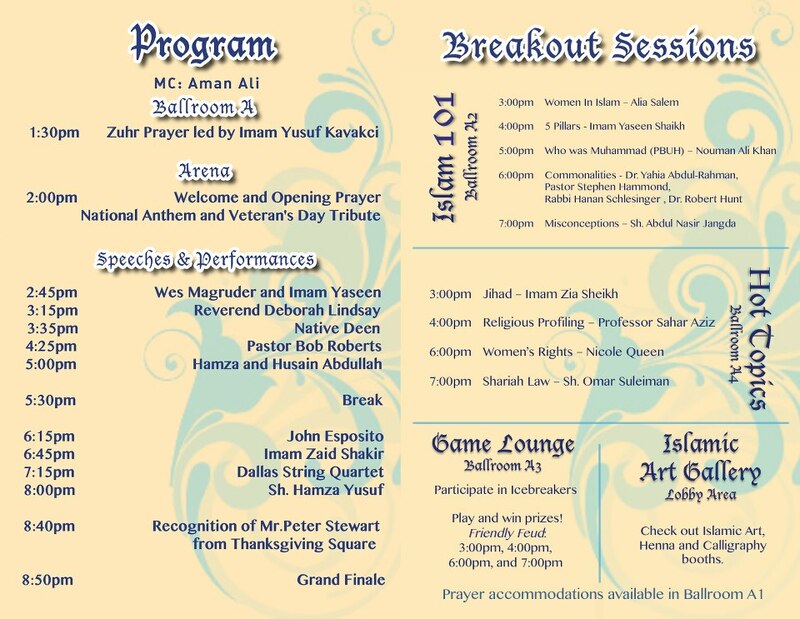 Other smaller additions to note are the Islamic art gallery, ice breakers, and game room for kids. The topics chosen for the speakers were also profound and kept the listener indulged in the topic. On the other hand, there were a few exceptions that could have made the event even better. For one, the camera man in the beginning was doing a horrible job! By horrible I mean the screens showing footage of the speaker was shaking and at times focused on random spots on the stage! Another issue was the microphone. At times the microphone was either off (someone from the audience had to scream at the Aman Ali to have it turned on) or it would make that loud squeaky noise, which for an event as big as Waves of Unity, could lose its formality. Also, one of the biggest downfalls the event had was the organization and punchtuality of the smaller breakout sessions. Although most people picked up the small cute handbook with the schedule of the program, including the breakout sessions, not everyone was sure what was happening when! The program was a little behind schedule and for that reason I missed some sessions I wanted to attend, such as Imam Zia’s talk on Jihad, while other times my group had no idea what talk was going on when (again due to the mismatch of schedule). Also, some of the rooms were switches around from the original schedule which made it even more confusing. However, further down the event everything fell right back on schedule. Smaller cons included choosing one speaker over another, for example, I missed NFL Players (Hussein and Humza Abdullah)’s talk because Br. Nouman Ali Khan’s talk was going on at the same time (was planning to listen a little of both, but missed it entirely). Also I had to choose between Shaykh Omar Suleiman and Abdul Nassir Jangda! And finally….the amount of Muslims versus Non-Muslims. 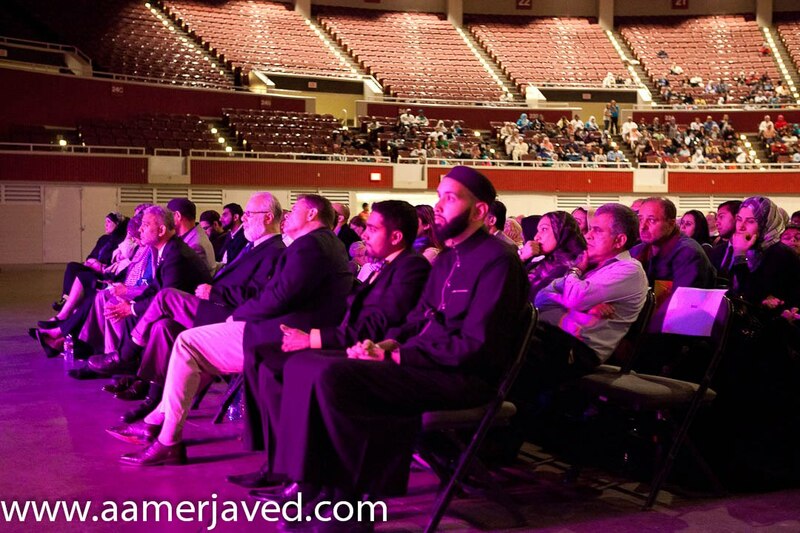 The ratio between Muslims at the event versus Non-Muslims, was probably around 1 in a 100 people! Just kidding, but it really did feel that way. Although it was really nice seeing all of my Muslim buddies from Dallas all over the event, Br. Nouman Ali Khan said something along the lines of, “My talk was directed towards Non-Muslims so if your out there, just listen up,” it would have been nice to see a larger Non-Muslim crowd. 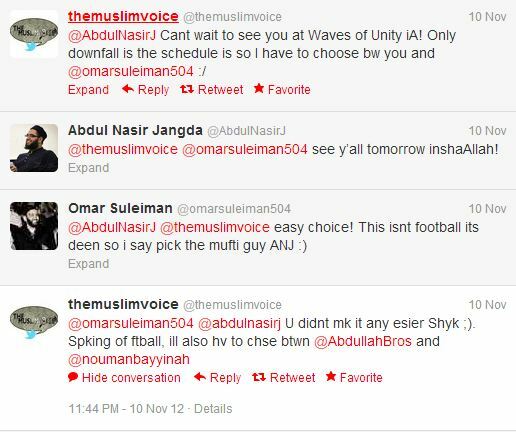 Okay so it wasn’t entirely the organizers fault, moreover us Muslims in the community should have invited more of OUR Non-Muslim friends and families to the event in order to have a greater impact. Halal-O-Meter: The event wasn’t really segregated between genders (although the seats from the breakout session sure did seem like it), but this was obviously done in order to make Non-Muslims feel more comfortable (imagine how awkward it would have been). Also, musical instruments were used by the Dallas String Instruments (hence the name), which may be an issue for more conservative Muslims, but again the choice of altering between a Muslim and Non-Muslim band was done purposely and with good reason. Overall a good family and Islamic environment. I might have been a little harsh or I might not have been harsh enough, regardless, beyond the few negatives and issues, “Waves of Unity” will be a memorable and a good precedent for future events of its kind (or a set of annual events). Big props to the organizers, sponsors, committee members, and speakers who made this happen, subhanAllah! Apologize big time for thinking you were a former navy seal lol! Seeing so many badges and accomplishments you’ve done I believed you really were part of the Navy seals. Again I apologize, I’ll update the information :). Wa Iyyakum thanks for the correction! Also just to add, that’s still a great accomplishment mash’Allah! Previous Previous post: Spotlight: The Muslim Ummah Talk Elections!